Grab yourself a copy of Rapid Bikes issue #88 with tests on Ducati’s awesome Panigale 899, plus its bigger brother the amazing 1199 Panigale, not to mention the up-spec Panigale S! We also take the wicked MV Agusta Rivale 800 through its paces in the twisties and jump on board Kawasaki’s aggressive new Z1000. Tweaked features include an awesome lineup, from Steve Martin’s famous 1296cc Period 5 Katana, to a Special Edition YZF-R1 that makes your regular R1 look plain, a wicked 200hp Yamaha VMAX, a supercharged Night Rod Special by Speedys Motorcycles and a sweet VFR ‘Fighter and decked out KTM 690 Duke R.
In Tech Tips we’ll take you through fitting an alarm to your pride and joy, while Workshop is the first installment in an engine rebuilding How-To series. 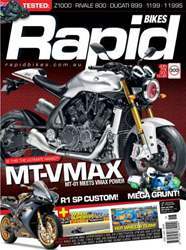 And of course all the regulars such as Flipped with Matt Mingay and ET for your drag racing fix and all the regular columns. In the Knee Down track section you will find columns by Steve Brouggy, Remy Gardner, Andrew Pitt, Bryan Staring and Emma Bailey of EJB Exercise Physiology. We cover the Island Classic, the Troy Bayliss Classic and follow Mark Weaver in competing the first two rounds of the St George MCC series. We also have a quick chat with Dylan Code, as well as Moto3 Australian young guns Jack Miller and Arthur Sissis.